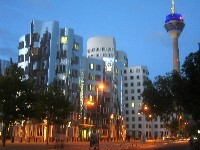 In Düsseldorf, the capital of North Rhine Westphalia, there´s lots to see and discover. Whether as a tourist or a business traveller, let this carnival city take you in its grasp and you can leisurely acquaint yourself with this lively Rhein metropolis of art, culture and business. Our Limousine Service Düsseldorf will take you comfortably and conveniently to your desired destination at any time of the day. From airport transfers to meetings or business banquets, driving takes time. Even if it´s only a few minor details, sometimes every minute counts, time which could be used to look through those important papers or make a few telephone calls. 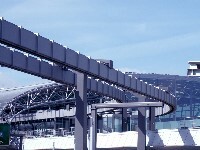 Or perhaps you would like to discover Dusseldorf away from the usual tourist crowds, with an individual, unique sightseeing tour organized just for you over all seven bridges of the city. Take the time to visit the opera or the art gallery which have brought Dusseldorf the appropriate title of City of the Arts and enjoy the wonderful works of art. Or perhaps you would prefer a relaxing shopping tour , where you can completely concentrate on your pending shopping treat, while an experienced driver chauffeurs you safely though the traffic. If you visit Dusseldorf in July, then you should plan a visit to the biggest fair on the Rhine. For nine days you can sample the lively festival atmosphere on the meadows of the Oberkasseler Rheinufer. And should you perhaps have a beer or two at the festival and find constantly looking for a taxi cumbersome and tedious, then our Sedan Service Dusseldorf is the best alternative. The city is well known for its wonderful old town, which was christened the „longest bar in the world“ by the „Toten Hosen“ and where there is always something going on. In contrast to the picturesque old town is the panoramic view of the media harbour, a modern skyline dominated by the curved buildings designed by the architect Gehry. Since 1999, Gehry´s architecture, with its imposing tilting walls and leaning towers, has become an extravagant new landmark in Dusseldorf, competing against the old castle tower on the castle square. In the variety of entertainment halls, which are unique in Europe, you can see international top stars from the music and comedy scene and enjoy fantastic live performances in a super atmosphere. Our Limousine/Sedan Service Düsseldorf will get you to the event on time and with no stress and will pick you up again afterwards. Our service is at your disposal around the clock. Our Sedan / Limousine Service Dusseldorf has numerous services on offer, whether for business roadshows, sightseeing, shopping, airport transfers, hotel or trade fair transfers, or even for trips to or meetings in Cologne. Our exclusive passenger transport services are uniquely arranged to suit your individual needs. Give us a call and let us know your requirements – we´ll make it possible.